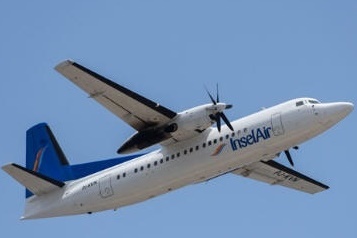 January 12, 2017 - Dutch Caribbean aircarrier, InselAir which operates out of Curacao, will suspend flights to Quito, Valencia, Miami, Haiti and Havana in an effort to reduce costs while facing financial difficulties. Flights to Quito (Ecuador) will halt from January 12 to June 19, during its low season and will discontinue the Miami/Port au Prince and the Curacao to Valencia flights until its next high season. InselAir believes its current financial restructuring will bring the company back to profitability. InselAir is one of the largest Caribbean carriers in the region, it serves 21 destinations throughout the Caribbean, South America and North America. The carrier transports over a million passengers per year and offers 140 city pairs with a current fleet of 8 aircraft. The company's fleet consists of McDonnell Douglas MD-82 and MD-83, Fokker 70 and Fokker 50 aircraft. Update- January 26, 2017 - The Department of Civil Aviation of Aruba (DCA) is conducting routine inspections on 4 of the in total 8 aircraft that InselAir Aruba currently has in operation. Inspections on 2 of the aircraft are being completed and the aircraft are scheduled to go back into operation within the next couple of days. Insel Air International and Insel Air Aruba has never had any major accidents, the following are incidents accidents and incidents that occurred with the two companies. On August 29, 2015, Insel Air International, flight 7I533 operated by a McDonnell Douglas MD-82, was enroute from Princess Juliana International Airport in Sint Maarten to Toussaint Louverture International Airport in Haiti when the crew received a fire indication for the left engine east of Santo Domingo prompting the crew to shut down the engine, causing the flight to divert. The aircraft landed safely at Las Americas International Airport. Emergency services did not detect any evidence of an engine fire. On September 2, 2015, Insel Air International, flight 7I901 operated by a McDonnell Douglas MD-82, was enroute from Curaçao's Hato International Airport to Miami International Airport when the crew received an engine indication enroute near Santo Domingo prompting the crew to shut down the engine, causing the flight to divert. The aircraft landed safely at Las Americas International Airport. On November 18, 2015, Insel Air International, flight 7I534 operated by a McDonnell Douglas MD-82, encountered problems while climbing out of the Princess Juliana International Airport of Sint Maarten and had to shut down an engine due to loss of oil pressure. The aircraft returned to Sint Maarten and landed safely, 20 minutes after departure.